With bright minds gathering at the European House-Ambrosetti forum on the banks of Lake Como in Italy, Europe is facing a number of pressing issues: the looming trade war with the US, the refugee crisis, and EU reform. Can the current system face up to today's challenges? 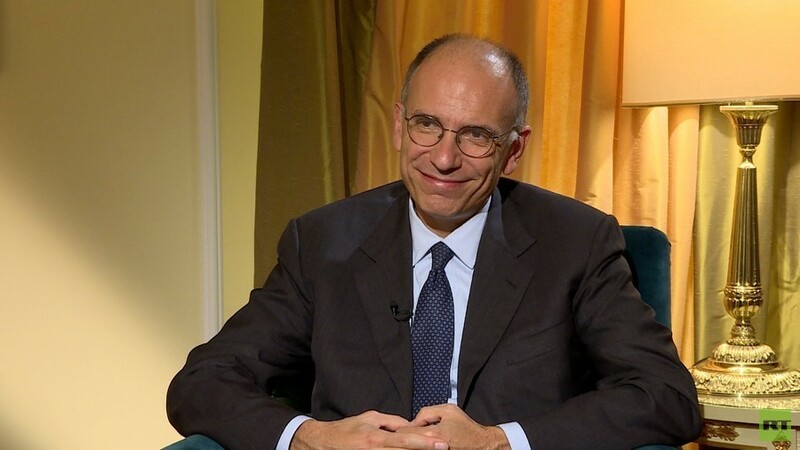 The former prime minister of Italy, Enrico Letta, shared his perspective. Sophie Shevardnadze: Enrico Letta, thanks for being with us today. It’s great to have you as our guest. Lots to talk about since so many changes are taking place in Europe. So, Europe’s lucrative transatlantic trade may be in jeopardy, and Trump right now is saying “you know what, the U.S. will outlast Europe in this trade stand-off and we’re going to negotiate hard to make peace on American terms.” What’s going to happen? Will Europe just have to capitulate, what does this mean? Enrico Letta: I think, Trump is becoming the best ally of the more united European Union. Trump is pushing Europeans to understand that we have to be together because the only way to be together means reacting to these threats. I think, the trade threats of Trump is a mortal threat for Europe. It’s a mortal threat because the model of the European economy is based on export, on producing more than we consume. And that is crucial for the future of the European Union. If we have the world of protectionism, if we’re obliged to produce only for the internal consumption this will be the end of the European economic model. This is why trade is becoming the big gap between the European Union and the U.S.
SS: Trump is also threatening to pull America out of the WTO if everything doesn’t go the American way. What would that mean for Europe and for the organisation? EL: I think, for WTO it would be a mortal threat too, but at the same time I don’t think it’s possible to have trade at multilateral level without a multilateral organisation. We can’t have only bilateral agreements between countries. We need to have an international multilateral organisation. WTO was this organisation, it worked during some period of our history, even recent history. I think, Trump attacked multilateralism and Europe at the same time. I think this double attack is a big signal for us - we have to react. We were always an ally of the U.S., and we’re still an ally of the U.S. Trump is another thing, Trump is really a threat for us. SS: Let’s talk in more details in terms of what the European reaction should be. Because Trump is threatening to slap import taxes on 200 billion dollars worth of Chinese goods, he then said that “The European Union is almost as bad as China, only smaller”. What do you make of it? What does this mean? And should Europe be preparing for import taxes from Washington as well? EL: I think, reactions can be considered in this term as well. But at the end of the day Trump’s protectionism is affecting Europe more today than China. The decisions Trump took until now were first the decision against friends, allies. Friends and allies like the European Union or like Canada or Mexico don’t have any customs or protectionism with the U.S. We were really in a very good relationship in terms of trade. China already has many barriers with the U.S. So the decisions of Trump today are affecting more the European Union, Canada and Mexico than China. That’s why we’re so angry with him and that’s why our reaction is in terms of counter-reactions to the U.S. but also turning to the East. SS: What are the other things Europe could do? Slapping tariffs in retaliation to a hostile action is maybe a strong thing to do, but that will not end the trade war itself. Is there anything else other than new trade taxes that the EU can do and turning to the East? EL: We will hope the Democrats can defeat Trump in the next election. EL: Right. At the end of the day, I think, Trump is doing what he said in the electoral campaign. I’m not surprised by the direction he took. The point is that that direction is a wrong one - the direction of saying “America First” or “America’s Industry First” is the demonstration that we can start trade wars. Trade wars among Western countries, among WTO countries, among West and East are the way to waste opportunities, to destroy jobs, to destroy the recovery in our part of the world. This is why retaliation and reaction and the global act from the European Union, this is why I mentioned the Eastern countries, I can mention also, for instance, Mexico. We have to have a new deal with Mexico because this is a demonstration that we want to be positive and proactive towards the North America. But we can’t accept this attitude of Mr. Trump. SS: Ok, so you said in the beginning of the interview that whatever is happening is a mortal threat to Europe. But I’ve also heard you saying in an interview that Trump’s hostile attitude towards Europe is actually going to help Europe to grow up. It’s funny because it’s what we, Russians, say about the sanctions - the sanctions will help us grow up. But are you, guys, (by “you” I mean “the Europeans”) ready to defy America on serious issues like Iran sanctions, for instance? EL: I think, it’s really unacceptable what happened to Iran. So I think we really need to think how to avoid the bad consequences of Trump’s decisions on Iran. It depends on the next elections. It depends whether Trump will be re-elected or not. One scenario is Trump’s sort of parenthesis is one term and then is a sort of nightmare that can end up and we can start again with this strong alliance and strong working together between U.S. and Europe. If Trump gets re-elected in 2020, that is profoundly different. This is why the next months will be important to follow this evolution. SS: Ok, so let’s talk a little bit about Italy’s and Europe’s relations with Russia. Europe and Russia have separate relations, they are much more tied historically and economically than Russia and America. Russia and America is more strategic partnership more than anything else. Practically all the political forces in Italy that I’ve come across are for close cooperation with Moscow. I don’t know any Italian politician - whether it’s conservative or democratic or the alternative parties - that would say “we need to make war with Russia”. All of them say “we need to co-operate with Moscow, that’s the only way”. But when it comes to lifting the sanctions the only thing Italy can do is just vote against the automatic extension of sanctions. Why, do you think, Rome can’t be stronger in saying “maybe we should get rid of the sanctions if we understand that this doesn’t benefit Italy politically or economically”? EL: Because it’s necessary to understand that this diplomatic situation needs a diplomatic pride and a very wise approach meaning that maybe we need to separate, we have to co-operate on many things and we have to freeze a little bit the problems we’re having. Without raising this problems as incontournable, as the French say, questions, co-operating on other issues and knowing that the European Union is composed by 28 countries today. And we have to respect that some of them have a different approach than we’re having as Italians. And if I may say, it’s the demonstration of the fact that on foreign policy the European Union has to make steps towards the unification of the position. And maybe we need to have an institutional framework to make decisions by majority, without finding always the consensus rule. But you know, it’s an internal problem of the European Union because the difference is that Russia is one country with one president and one parliament, the European Union means 28 countries with one parliament plus 28 national parliaments, one commision. So there’s a clear and balanced institutional situation. I think, it’s necessary for Russia to know this difference. Russia knows it very well, President Putin knows Europe very well and he knows the complexity of the European institutional architecture. And this difference is a big difference. SS: Mr. Letta, let’s talk about the differences within Europe because you’re probably one of the best speakers to speak for the European Union as a whole. The refugee crisis which is hitting the European Union is really hard right now. Italy and Hungary are creating a united front against migration. They seek support of Austria and the Visegrad Group, and they saying that the 2019 European Parliament election is going to become a referendum on a “Europe without borders” that Emmanuel Macron has proposed against “Europe that protects itself”. This division - can this be something fatal for Europe? EL: I think, you’re right. The European elections next year will probably be the most important European elections ever. In the European history the European Parliament elections have always been the elections in which - it seems a joke, but it’s reality - Europe was not the matter, not the core of the discussion. Each country was using the European elections to discuss domestic affairs, to try to check the popularity of the government and so on and so forth. It is the first time the European elections will change in any way the European path because, you know, for twenty years until now the European Parliament was formed around two big political pillars: centre-left and centre-right. All the political decisions even on Russia sanctions or trade issues are an outcome of an agreement between these two political families. So, the European Parliament is an easy landscape you need an agreement between the two groups and that’s it. That will change next year. Next year you will have fragmentation. Probably, it will be necessary to have an agreement between four groups to have a majority, that means a completely different decision-making process on the European level. I think, next year at this very period we’ll say “oh, the old good times of 2016 or 2017” because the European Parliament will be completely different, and in this European Parliament the other main point will be whether the populist parties are running together in a united group or they are divided, because, of course, if they are united and if they get 20, 25 or 30% of the votes that will change the European life a lot. That’s why the next year will be a turning point in the European political life. You mentioned migration. You know, migration is the typical point where the intergovernmental rule doesn’t work. If you have 28 heads of state and governments meeting at the table and the topic is how many migrants you take in, it doesn’t work. The answer will always be “zero”. I, as Prime Minister of my country, want no migrants, I want zero. But if you have refugees coming you need to have a supranational organisation like the European Commission taking the responsibility to say: “These are Syrian refugees, we need to welcome them and so we have to redistribute them between the member states”. It’s not the goodwill of one country saying “I can take one thousand or one hundred”. It’s a different way. With the intergovernmental rule it will be impossible to solve the migrant problem in Europe. EL: Yes, but you know, this agreement between Italy and Hungary is a contradiction. Italy is the country of first entry in the European Union because it’s a Mediterranean country like Greece. So it’s almost impossible to block any arrival because of the coastal geography of Italy. So the first need of Italy is to have the solidarity of the rest of the European Union. When we have refugees arriving we need other countries to show solidarity towards us. Orban and Hungary are giving the least of solidarity. They don’t want to have any migrants. So the big contradiction is that Italy needs exactly the opposite. Italy needs a European situation in which… You know, we had a crisis in 2015, it was a very difficult crisis. But if you have 500 thousand refugees arriving, and if you are a continent of 500 million people, if you spread all these migrants in all the continent, you can at the end of the day welcome them, you can live with this problem. But if you welcome them only in one country - Italy or Germany - the problem is absolutely inconceivable and unsolvable. This is why only a European solution can give some answers to these migrant flows. Of course, we have to control our external borders. I’m not for open doors of Europe to all migrants. It’s not manageable. But for refugees coming from wars that the West… You know, Iraq, Afghanistan and Syria - these three countries are countries of origin for half of refugees during this crisis. These are the three countries where the big mistakes of the West - the U.S. first of all - were made. So it’s necessary to give an answer that’s a unified answer. SS: So what are the chances of Emmanuel Macron’s proposed EU reform to be implemented, to come to life with so many obstacles on its way? You need the German backing, you need Chancellor Merkel to back you, her position at home is weakened, and Germans are very wary anything pan-European, because they hear that and they automatically think they need to pay for everything especially the poorer countries. So she will have to back the reform, back you and maybe weaken her position at home. Then the Germans also say that for this reform to undergo all parliaments need to agree which is an impossible thing to do. What are his chances of this reform coming to life? How realistic is this? And do you still believe that Emmanuel Macron is the big unifier? EL: Among many bad news in the European Union during the last period there was one good news - the agreement between France and Germany on some reforms of the Euro area. They had this agreement in the end of June in Meseberg. I think, Italy has all the interest to support and to have the possibility to implement part of this agreement. It’s an agreement on how to create a eurobudget. The eurobudget needs to create an insurance against unemployment, and Italy needs social measures to complete the financial architecture of the European Union. The European Union is the financial architecture with the lack of a social pillar. So what I would like to see is my government pushing for the reform in that direction, not for less Euro, because we have the Euro, the Euro is there. And we have to complete the architecture. So what Germans and French agreed in Meseberg was the first step that’s interesting. It’s in our own interest as Italians. There are many difficulties, I’m not sure that all these reforms can be approved because of the differences, and also because of the fact that the main problem of the next few months will be Brexit. If you ask me what is the biggest worry we have today it’s not all we talked about, it’s Brexit. We’re going towards Brexit - towards the cliff edge as we say, towards the disaster. There’s no plan A, no plan B and even no plan C. There’s just approaching March 29th with the idea that the day after will be a disaster. This disaster will create big financial instability, and we will suffer a lot. This is why I’m really worried about Brexit. This is why you have to add Brexit to all what I said about the next year’s elections. The elections will be in May, Brexit will be end of March. We will have, I fear, a very sad spring. We will have to think about the future of Europe thinking that we will have to overcome all these difficulties, and the next year will be a very complicated year. SS: Hopefully, you’ll overcome all the difficulties. All the best of luck to you. Thank you very much for this interview.